Since Samhain in our traditions is the new year and the crux of the ritual year in many respects, it is usually celebrated over a period of several days and includes offerings to a range of divinities. The astronomical cross-quarter date (the date marking the mid-point between Equinox and Solstice) generally falls about November 7th on the modern calendar and likely would have been reflected in the original observance dates of the festival. Modern practice tends to center Samhain festivals around the primary date of October 31. In early Ireland, royal feasts such as Samhain would likely have taken place over a week or more. The early continental Celtic Coligny calendar references the Trinoxtion Samoni “three nights of Samain”. Some Celtic reconstructionists mark the “three thirds of Samain” – October 31 as Samhain itself, plus 3 days before and after (Oct 28-Nov 3). Some contemporary practitioners observe a 9-day Samhain cycle. In our own practices, we tend toward a 3-day observance. Sacrifice: Many traditions reference animal sacrifices being important at this time. Folk practices for the Catholic feast of Martinmas on November 11 include sacrifices of poultry, and this is thought to be a survival of pagan Samhain sacrifice customs. Blood offerings were also made at the Morrigan’s cave at this time. Feast of Tlachtga: Early Irish literature says offerings to Tlachtga should precede other Samhain observances. The lighting of a sacred fire and offerings to Tlachtga were a traditional element of druidic rites of Samhain in early Ireland. Feast of Ériu: The Festival of Tara was traditionally observed during Samhain, and would have included offerings to Ériu and her sisters, Banba and Fotla. Feast of the Morrígan: We mark Samhain as the Morrígan’s devotional holy day with special offerings. We also devote offerings to each of the individual goddesses of the Celtic war goddess collective at this time: including Badb, Némain, Macha, and Anu. Macha also has her own feast day at Lughnasadh, but we include her here as well. It is also appropriate here to celebrate the mating of the divine couple, the Morrígan and the Dagda, which lore says this took place around the eve of Samhain, and which brings victory and sovereignty to the tribe. Feast of Cathubodua: Gaulish lore lacks any specific indications for a feast day for Cathubodua, but we consider Samonios/Samhain an appropriate time to honor her, as one of the Celtic war goddesses and a close cognate of the Morrígan and Badb. 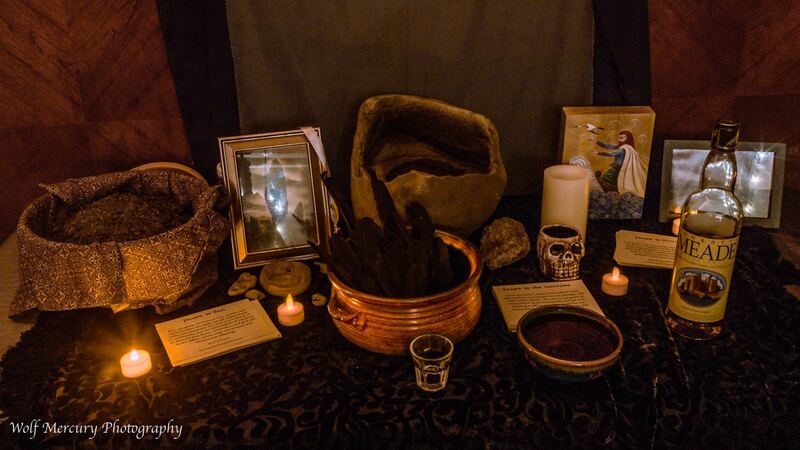 Feast of the Fallen: Ancestor veneration, including honoring of the heroic warrior dead, personal and beloved dead, and ancestors of tradition. Based on the traditional feast day of St. Gobhan of Ireland, whose name is likely derived from Goibniu, we have chosen this date to honor him. Observances can include offerings of beer, epecially home-brewed, offerings or activities related to smithcraft, and anything made by our own hands. It is also an appropriate time to sharpen or perform maintenance on weapons and tools. The date of this feast is based on astronomical observance of Winter Solstice, so its date can shift 1-2 days in any given year. We consider the Winter Solstice an appropriate date for the Dagda’s feast day based on his close association with Síd in Broga (Newgrange) temple, where a prominent sacred alignment brings the rays of the Winter Solstice sunrise into the mound. For those who also honor Áengus Mac Óg, the son of the Dagda, this would also be a suitable time for devotions. Observances for the Dagda should include acts of hospitality: holding a feast, sharing food with others, perhaps feeding the hungry or homeless. Offerings of beer, fresh bread, butter, and cauldrons of stew are suitable. Music-making, especially harp music, and the telling of stories. Some practitioners choose to hold vigil with fires lit through the night until the Solstice sunrise. Imbolc is well attested as a holy day dedicated to St. Brigit in Ireland and likely based on earlier festivals associated with the goddess Brigid. Brigid is customarily honored with lighting of candles and offerings of dairy foods (milk, butter, cheese), beer, whiskey, and honey, as well as the weaving of Brigid’s crosses. It is also traditional to gather the dew of Imbolc eve on pieces of blessed cloth called brat Bríde or “Brigid’s cloak” which are held to have healing properties. As part of Brigid’s cult associations, the time of spring in general and Imbolc especially is associated with purification customs and specifically rites of warrior purification. We also like recitations of poetry in Brigid’s honor. This date has been adopted by some Celtic Polytheists based on research indicating that St. Patrick’s feast-day may have replaced a pre-Christian holy day. Since Irish lore points to warrior emergence or taking-up-arms around this season, we set this date as our feast day for Cú Chulainn. He may be honored with horns of mead or beer, and if a meal is held, the best portion of meat can be offered to him as the Champion’s Portion. Martial practice and games are also suitable, especially hurling, as well as special attention to dogs in the family or charities that help dogs. Given the strong associations of Scáthach with the Isle of Skye, we have adopted the feast-date for the patron of the Isle of Skye, St. Máelrubai, as her holy day. Offerings of Skye whiskey are suitable, along with food and drink to suit a warrior. Martial practice and training are also natural activities to mark her feast day. Since the coming of the Túatha Dé Danann to Ireland is traditionally associated to Bealtaine in the First Battle of Mag Tuired, this is a suitable time to honor them as an entire collective, including any divinities among the Túatha we want to honor individually but who don’t have their own feast day. It is a good time to perform retellings of the coming of the Túatha in their ships of mist, and of their taking of Ireland. We also choose this date to honor Nuada, as the first king of the Túatha, and a divinity embodying service and sacrifice. Offerings of whiskey, beer, and spring foods, as well as seafoods are suitable (since Nuada has connections with the sea and fishing). Blood offerings at Bealtaine are also traditional in folk practice, such as the practice of blessing the fields with blood from cattle to ensure a good growing season and fertile harvest, so this is also a traditional time for sacrifices to be performed. We have adopted this date as the feast-day for Finn mac Cumhaill based on research indicating that the folklore of St. Colm Cille may have appropriated elements of of Finn’s mythology. As Finn is both warrior and poet, some activities to honor him might include poetic recitation, martial practices, hunting, wildlife activities and camping outdoors. He’s also strongly associated with fidchell, so strategy games such as chess are also appropriate. Offerings could be things such as ale, whiskey, salmon, venison or other wild game. The Summer Solstice is established as a traditional holy day of Manannán in the Isle of Man, his mythic home. This feast-day is traditionally celebrated on dates varying from June 20th to June 25th based on the movement of the Solstice and local folk tradition. Folk practices in the island center on “paying rent to Manannán” by making offerings into the sea. A traditional offering based on Manx folk tradition is pouring ale into the sea; offerings such as beer, sea foods, and other summer foods are suitable. As Manannán is also a master of magic, illusion, poetry, and druidic arts, devotional practices focusing on these elements are also suitable to celebrate his feast-day. The festival of Lughnasadh is a well-attested and ancient tradition in Ireland. Historically, óenach tribal gatherings were held at this time at many important sites. The mythic foundations of Lughnasadh, and its name, refer to Lugh’s foster-mother Táiltiu, who is said to have died of the effort to clear the farmlands of Ireland for agriculture; Lugh instituted the festival and games in her memory. It is a time to feast, hold bonfires, honor the Gods, and give thanks for harvest. Óenach traditions also highlight this as a time for oath-taking, law-giving, marriages, martial games and horse racing, and the recitation of poetry and ancestral remembrance. Folk traditions also include many customs connected to horses, horse-racing, and ritual practices at lakes. The horse traditions of Lughnasadh also connect this festival to Macha; some versions of the story of her horse-race at Emain Macha place it during the races of the Lughnasadh óenach. We honor both Lugh and Macha on this date. In Coru tradition, this is the time of taking oaths. It is also a great time to hold community gatherings, with bonfires, feasting, games and martial practices, and offerings. For Lugh, offerings of ale or whiskey, fruits of the season and grain products, weapons and crafts, and demonstrations of skill are excellent offerings. For Macha, suitable offerings can include spirits, mead, grain, apples, and acorns (symbolic of “Macha’s Mast”, the heads of the slain.) Martial practices can also be dedicated to Macha as a battle Goddess, as well as horse-riding and acts of service that benefit horses.